California’s oldest operating institution of higher learning, Santa Clara University was founded in 1851 on the site of Mission Santa Clara, the eighth of the original 21 California missions. Adobe Lodge, a ceremonial dining and gathering hall, and Nobili Hall, a former Jesuit residence and dining hall are located in the campus’s oldest buildings. Moule & Polyzoides solved pedestrian, service, parking and conflicting public space issues while respecting historic character and creating appealing open spaces. 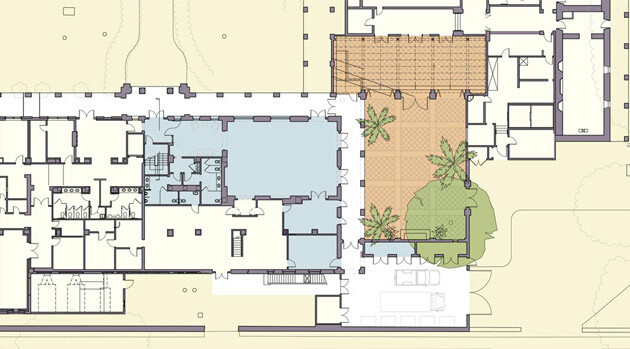 Outdoor spaces were consolidated into a single attractive and historically appropriate courtyard by enlarging and enhancing two existing patios. Terracotta pavers, accent trees, potted plants, a historically inspired fountain and a wall that masks noise from nearby traffic and parking create a shaded, intimate gathering space. New entryways were added to separate pedestrian and service traffic while new room configurations permit greater operational efficiencies. The plan, along with interior and exterior renovations, renews and preserves the character of the campus’s most important historic precinct while ensuring that modern needs are fully accommodated.